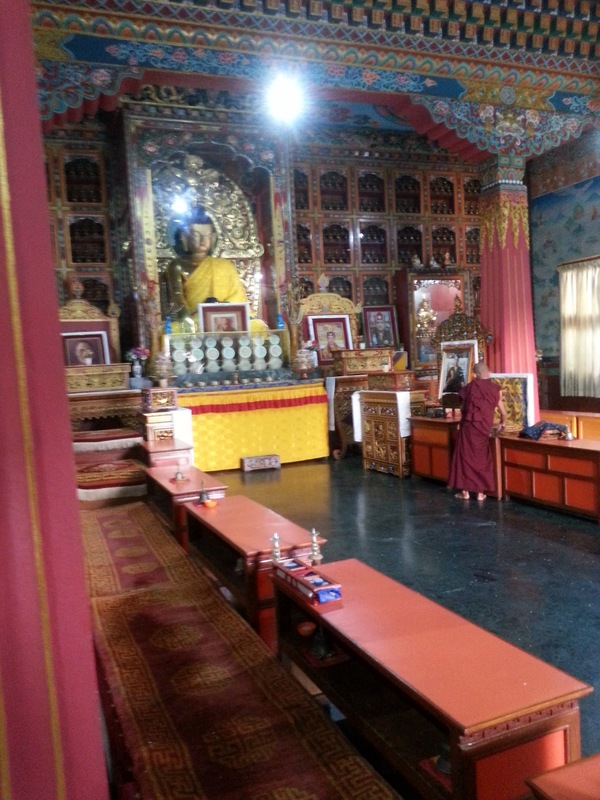 Throughout the tour, it was very clear how important Buddhism is to every Tibetan that we met, and how much the religious intertwines with every aspect of life. Tibet is a spiritual center for much of the Buddhist world. The Dalai Lama is considered to be a manifestation of Avolokiteshvara or Chenrezig, the Bodhisasttva of Compassion. Bodhisattvas are beings who have achieved enlightenment but have postponed it in order to help other beings. The current Dalai Lama is the 14th incarnation. He was identified at age two. Go here for more information about how the new incarnation Dalai Lama is identified. Among other tests, once candidates are identified, they are presented with objects from the former Dalai Lama and told to identify them. The current Dalai Lama has indicated that he won’t be reborn in Tibet while it is under Chinese rule; but he has also suggested that he may not be reborn at all, as the office of the Dalai Lama may be outdated and unnecessary for the modern world. After attending a morning prayer service in the temple shown above, we had a one hour conversation with one of the monks. We learned all about his life. All monks receive the equivalent of a master’s in Buddhist philosophy. The monk we spoke to had been at the monastery since age 7, when his parents dropped him off. He said it was hard for “a week or two” and he cried a lot, but then he adapted to life in the monastery. He didn’t see his parents for eight years after they dropped him off. He said this helped him rid him of attachment, which in Buddhist philosophy is the source of suffering. He can leave at any time; but after more than 15 years in the monastery, where would he go? Monks use Facebook to keep in touch with each other. Fewer families are sending their sons to the monastery. He watches movies on the weekend, and used the movie American Sniper to make a point about the focus required in meditation. 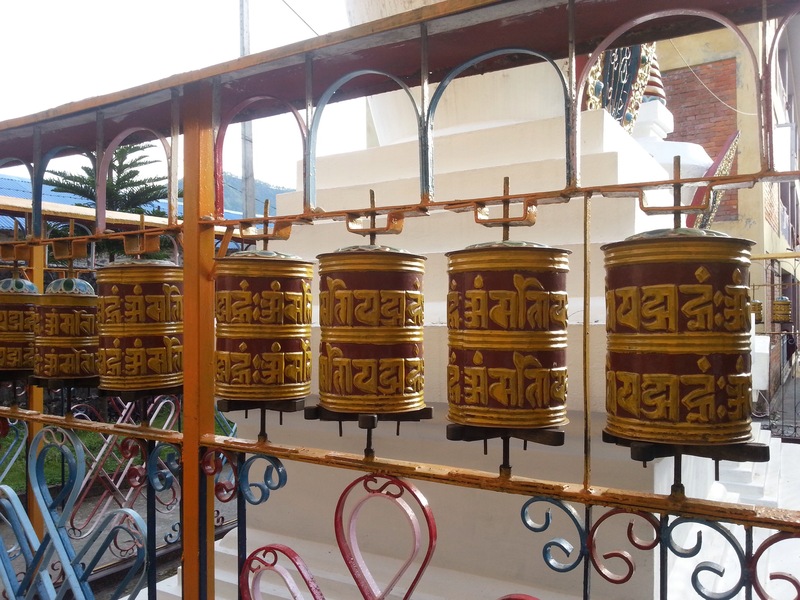 These prayer wheels contain 400,000 slips of prayer with the mantra “Om mani padme hum” written on them, referencing the purification of pride, jealousy, ignorance, greed and agresssion out of the soul. One turn of the wheel releases the phrase out into the world. It was implied that this would incrementally change the world for the better. Although, for all his cynicism, our guide clearly loved and respected the Dalai Lama. He referenced the Dalai Lama constantly, and quoted him maybe 40 times throughout the day. Our guide also seemed genuinely kind, like everyone we met. When commenting on the CIA agents who had been training Tibetan guerrillas but then had to stop on orders from Nixon, he said “It was very hard for them. They wanted to help us, but the orders came from the very top, so there was nothing they could do.” After years of being led on by the CIA who had promised help to restore Tibet, I thought this was a very generous response. The Dalai Lama has written over a dozen books. The patience, kindness and peacefulness of his followers has inspired me to read and learn more about him. I’ll let you know how that goes. This entry was posted in Travel and tagged Nepal. Bookmark the permalink.